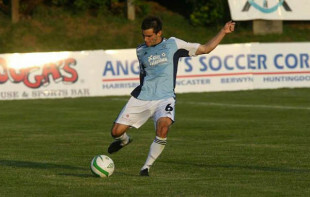 All of us at PSP are happy to present the first post from our newest contributor, Sam Hershey, who will be covering the Harrisburg City Islanders this season. As the 2014 season inches closer, the City Islanders will look to improve on last year’s fourth place finish in the league. The team’s preseason schedule consists of five games against collegiate teams throughout the month of March. Following the preseason, Harrisburg will travel to North Carolina to open the regular season against Wilmington Hammerheads. Because the first preseason game against University of Maryland Baltimore County was canceled due to snow, and the March 19 match against St. Francis at Millersville University was canceled because St. Francis does not have enough players to travel, the remaining three preseason matches will be against Penn State, Navy, and University of Maryland. Harrisburg recently announced that both goalkeeper Nick Noble, and forward Yann Ekra have re-signed with the team. Both are sure to be keystones of the starting lineup come April when the USL PRO season kicks off. Other important returning players include forwards Andrew Welker and Garret Pettis, midfielders Morgan Langley and Colin Zizzi, and defender Stephen Basso. Major losses include both of Harrisburg’s top scorers from the last season, Lucky Mkosana and Sainey Touray. Both players moved to teams in the NASL, Mkosana to Tampa Bay, and Touray to San Antonio. Two new faces on the team have links to Portugal. Edinho Júnior, a twenty year old forward from Faro, Portugal, has signed with the team. Edinho was previously under contract with Blackburn Rovers, although he only made one appearance for the EPL club. Also signed with the team is Clesio Bauque, the young Mozambique national who trialed with the Union over the preseason and was previously with Benfica. When the USL PRO season gets closer we will likely see multiple players from the Philadelphia Union loaned out to Harrisburg to supplement the current roster. Likely candidates include Cristhian Hernández and Jimmy McLaughlin, both of whom played with the Islanders last year on loan. Zach Pfeffer is also a possibility, but Union coach John Hackworth seems to favor him the most out of the youth players and might keep him in Chester. Union draft picks Richie Marquez and Pedro Ribeiro have also impressed in the Union preseason camps, and might be loaned out for playing time. Sat April 5th – Away vs. Wilmington Wilmington has historically been a weak team in USL PRO so this will be a great opportunity for Harrisburg to start the season strongly. Wilmington finished 9th in the league last season, missing the playoffs. Sat April 19 – Home vs. Dayton The home opener for the City Islanders is against the Dayton Dutch Lions. The Lions have also performed poorly in recent seasons, finishing just one spot above Wilmington in 8th place.